Betcha you cannot resist starting a project when your eye catches all those gorgeous colors! I keep most of my scraps in a laundry basket, but I have put "special" scraps - such as every itty bitty piece of Kaffe Fassett -- in ziplock bags in the laundry basket. I keep strips in several shoeboxes - one for 1930's, one for brights, one for batiks etc. Every once in awhile I pull some scraps from the basket and cut them into various sized squares, to be used in a project eventually. I've begun to try to organize my scraps too, because I think I'll be more likely to use them if they are nice and neat. I bought some clear plastic bins that are 16 quarts, I think, and I've separated them by color. Now, every once in a while, I sort them as they accumulate, and put them in their proper bin. It's kind of a pain, but it's gives me more of a sense of what I have to use in scrappy projects. I just had to buy bigger bins to accomodate my scraps. I sort them by color too. Fat quarters are seperate, as is yardage. 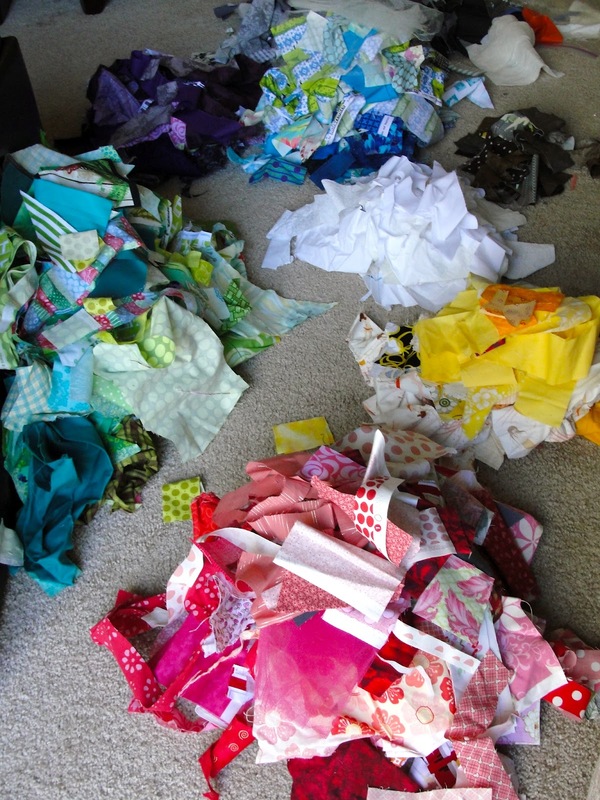 Bigger scraps are folded and sorted by ROYGBIV and stored on their side. Well, that was probably more than you wanted to know. And now I am dying to make a scrap quilt! I've been thinking about metal baskets to hang on the wall and hold scraps, like this http://www.ballarddesigns.com/webapp/wcs/stores/servlet/ProductDetailView?storeId=10052&catalogId=10551&productId=14893&langId=-1&SourceCode=BDSBT1. The colored scraps would still be visible and decorative, in a way. Go to firehouse subs for lunch, and then buy a few of their pickle buckets. Line them up under your cutting table and throw in the scraps into the correct bucket as you cut. When you registered your blog, did you see the Studio Organization in the Learning Center? I have my scraps in containers until I am ready to work with a color or two....then they are on the floor. I wouldn't dare leave them out all the time, the kitties would have a field day with them!